Mangalbag (Entry next to Bharat petroleum), Mangaldas Road, Ellishbridge,, Ahmedabad, India 380006. Another exciting film by The Nomad Cafe. 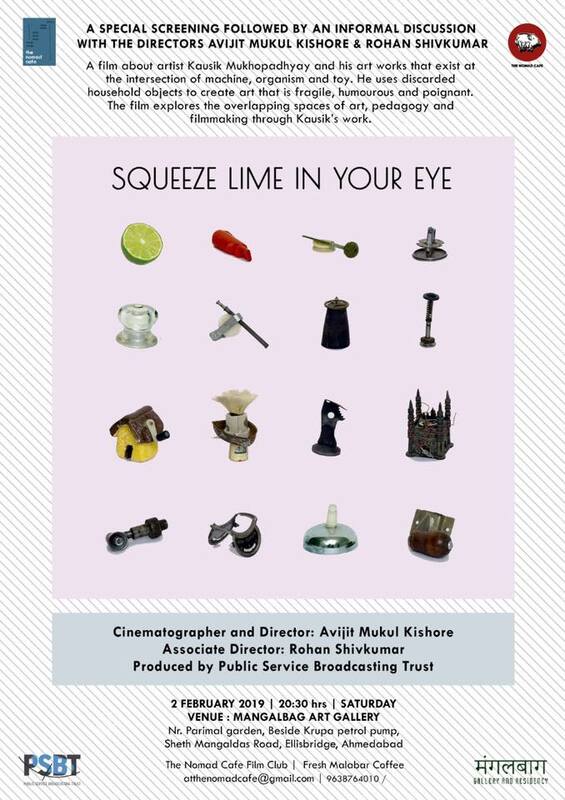 A film about an artist being screened at an art gallery in Ahmedabad. The filmmakers, Avijit Mukul Kishore and Rohan Shivkumar will be present for an informal discussion post the screening. A film about the inimitable artist Kausik Mukhopadhyay and his art works that exist on the peculiar intersection of machine, organism and toy. Mukhopadhyay studied Print-making at Viswa Bharati University, Shantiniketan and was a fellow at Kanoria Centre for Art, Ahmedabad. He uses discarded household objects to create art works that are fragile, humourous and poignant. The film traverses the overlapping spaces of art, invention and pedagogy through Kausik’s work. It follows him through his solo show titled ‘Squeeze Lime in Your Eye’ and in his practice as a teacher in an architecture school in Mumbai. Venue : Mangalbag gallery and residency.